Constructed in 1936 as part of the Works Project Administration (WPA), the Colby City Hall is a one-story, native limestone building. Designed by Suite and Blanchard of Garden City, it features the Art Deco style with the front façade accented by a stepped down chevron that projects vertically above the roofline to create a parapet. A pointed arch window with carved keystone is also prominently situated on the main façade. 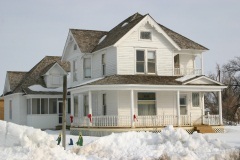 It was nominated as part of the "New Deal Era Resources of Kansas" multiple property listing for its association with the WPA, for its association with community development, and for its architecture. 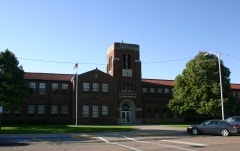 Designed by Mann and Company of Hutchison, the Colby Community High School is an Eclectic Mediterranean Revival-style, two-story brick building with Art Deco influences. An arcade of columns accents the front entrance. Constructed in 1935 by the Works Project Administration (WPA), it was nominated as part of the "New Deal Era Resources of Kansas" multiple property listing for its association with the WPA and for its architecture. The Philip Houston House was built in 1906 and is an excellent example of the Queen Anne-style with its asymmetrical form, bay window, multiple porches, and elaborate spindle work. Houston was a successful rancher and businessman who established the Gem State Bank. The house was nominated for its architecture and for its association with Philip Houston. 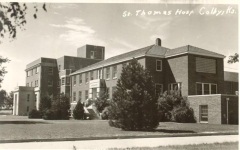 St. Thomas Hospital was constructed in 1941 through the Works Progress Administration (WPA), a federal program that funded the construction of 130 new hospitals nationwide and improvements to 1,670 more. There were only two new hospitals in Kansas constructed with WPA funds, one in Colby and the other in Oswego. The three-story Colby hospital was designed by Kansas City architect Joseph Radotinsky in the Georgian Revival style utilizing brick salvaged from the old high school on the same site. The facility was expanded in 1948, under the supervision of Wichita architects Overend and Boucher, to include a four-story addition housing a new polio ward and emergency facilities and a two-story chapel. It was nominated as part of the New Deal-Era Resources of Kansas multiple property nomination for its significance in the areas of health and medicine. 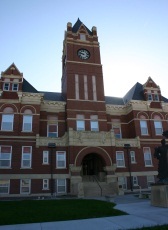 Built to replace the original wood frame courthouse, the Thomas County Courthouse was constructed in 1906-1907 of red brick. Designed by the architectural firm of James C. Holland and Frank Squires of Topeka, it is Richardsonian Romanesque-style and has a Syrian arch, a design feature of the style, over the main entrance. The contractor was L. Crosby and Son of Kansas City, Missouri and the subcontractor for the steel fixtures was let to Art Metal Construction Company of St. Louis. The building was nominated for its architecture.